"What do you get when you cross poison ivy with clover? A rash of good luck!" Kid's LOVE riddles and that's why I've created St Patrick's Day Riddle Coloring Pages! This title offers 8 coloring pages, each with a cute St. Patrick's Day themed riddle. God's Workmanship? Five Things You Can Do! Let's see what the God's word says about it! EVER WONDER JUST WHAT THIS MEANS IN YOUR LIFE? This scripture teaches us that God has a great plan for us! He has planned our lives and the work we are to do with the purpose of loving God and loving people as the power behind our good works to bring glory to His Name. 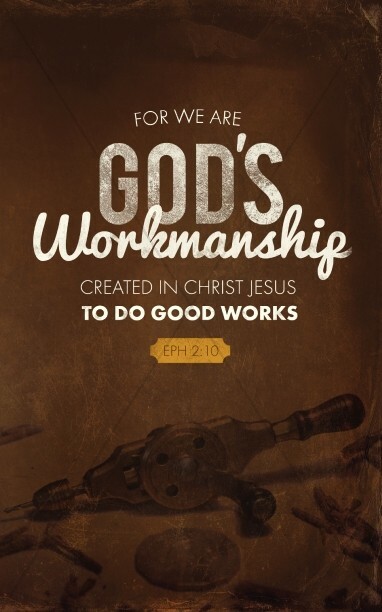 “We Are His Workmanship” is teaching us that we belong to Jesus and as we use our gifts and talents for the Lord we build each other up, and bring glory to God. When we bring all of our gifts; our abilities, our time, our lives to Jesus He takes them and makes something very beautiful in our lives. When He does this, we influence others to seek God and we grow closer to the Lord. His Presence flows through us and we “glorify” the Lord in all that we do and say. These are the good works that He planned for us even before we were born. These good works help other people know God more! You might do good works through your drawings, or paintings, or singing, or playing an instrument. You might do your good works with acts of kindness to others, feeding the poor, or encouraging a friend. Salvation comes as a free gift to us when we receive Jesus as our Lord and Savior to forgive us our sins and give us new life in Him. After Salvation we give our daily life to God to walk in the good works that He planned for us when He designed us. He made us so He knows us better than anyone! He knows what gifts and talents He has given us and He wants to pour His power through us to accomplish many things in His Name. God’s number one priority in the “works” department is loving and blessing people with whatever abilities you have! 1. Write down all the things you love to do. 2. Now ask God to show you how you can do those things to show others your love for God and for them. 3. Keep a dream journal. 4. Cut out pictures of all the things you love to do and make a collage. 5. Pray and ask the Lord to speak to you all the dreams He has for you and to help you walk in all the good works He has planned for your life. There is no one in the world like you –you are a one of kind person! No one can do things exactly like you can and the Lord knows how He has made you!